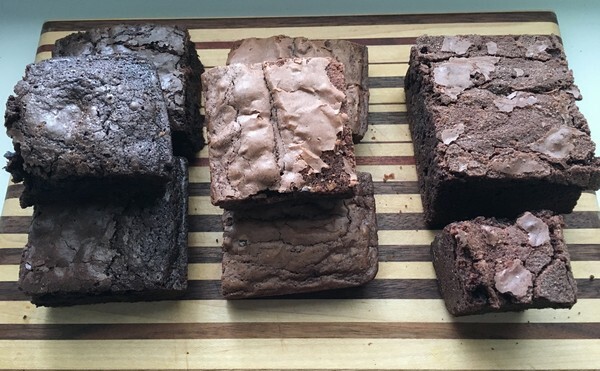 Since the Accidental Locavore’s pig roast, a brownie taste-test has been on my to-do list. One of the winning dishes was the brownies our friend Joe made and several people were clamoring for the recipe. His secret? Betty Crocker’s Ultimate Brownie Mix! We were stunned and I vowed to put it to the test against my favorites from Tom’s Heritage Baked Goods at the Milan Farmers’ Market. Somehow the summer got by me and while I was happily grabbing a couple of Tom’s brownies at the market I never put them to the test. This weekend may have been the last for the farmers’ market and my easy access to great brownies so it became critical to try them against a mix, or in this case two mixes. 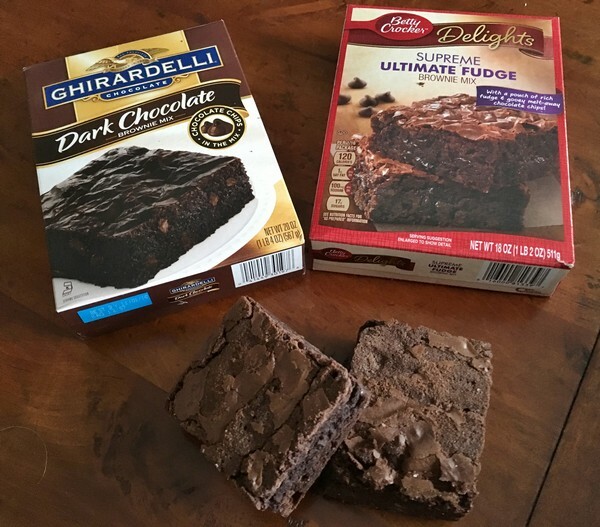 Someone had done a taste test recently and voted Ghirardelli the best, so I grabbed a box of their dark chocolate mix and Betty Crocker’s Supreme Ultimate (can’t get enough superlatives) Fudge Brownie Mix. The last time I’ve baked cake or brownie mixes was probably sometime in the last century. The first surprise was how easy they are! An egg, some vegetable oil, water, mix and you’re done. Pop in a pan, bake for about 40 minutes and that’s it. 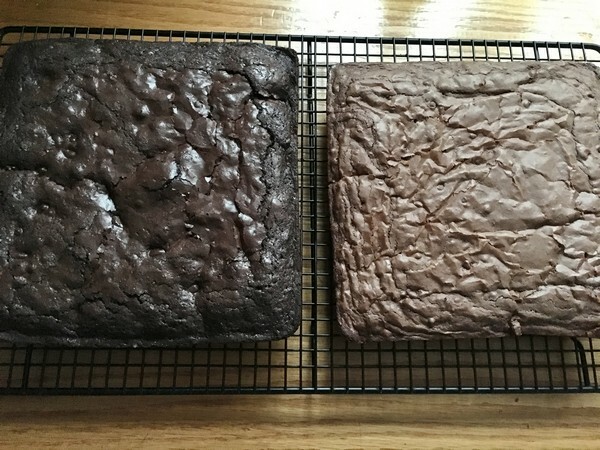 I let both batches cool before tasting them so it would be a level playing field with Tom’s brownies. All three were good. The Betty Crocker brownies were the lightest in color and I may have slightly overcooked them. They had a pleasant taste but weren’t intensely chocolaty and certainly not as good as the ones I remember from the pig roast. Both Frank and I thought these came in third. Although we differed in our opinion of the winning brownie, it was almost a dead heat. And asking a third friend for their opinion, didn’t break the tie as she was “I can’t give you a definitive brownie answer. I think they were both very good. I went back and forth…” Frank went for Tom’s while I preferred the Ghirardelli. Both were dense and had great chocolate flavor and I’m still a big fan of Tom’s brownies! He makes a great product, using real butter and good chocolate and I’m happier knowing who and where my brownies come from. But if I need a quick brownie fix during the winter, it’s good to know that a quick trip to the supermarket and 40 minutes in the oven will take care of my chocolate cravings. I use the Ghriadelli mix too. We don’t have TJ’s near here so have never tried the brownie mix, but did do a taste test: http://wp.me/p2SJwY-1b4 and the results might surprise you. You probably could just top mix brownies with the cheesecake topping–I don’t see why not. I love the ghiradelli mix so I rarely make them from scratch which does go against my midwestern roots…I have also tried Trader Joe’s ultimate brownie which is good but have not done a taste test bewtween the two. I’m not too picky with brownies, but Ghiradelli is good when I’ve had it. I prefer made from scratch, but I’m sure I wouldn’t be able to tell the difference when they’re both in front of me! Joe’s always welcome to make them again!! Try the Ghiradelli and let me know what you think. Someone also recommended the mix from Trader Joe’s. Clearly, Joe has to make those brownies for you once again, or I need to try the Ghiradelli:). Previous post: 50 MPH Tomatoes-Good Year Round!